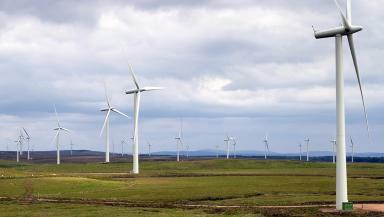 The 35-year-old was pronounced dead at the Whitelee Windfarm on Wednesday. A worker has died after falling from a turbine at the UK's largest onshore wind farm in East Renfrewshire. The 35-year-old Spanish man was pronounced dead at Whitelee Windfarm, near Eaglesham, on Wednesday morning. The turbine is understood to have been undergoing maintenance at the time but this was not linked to his death. A Scottish Power spokesman said: "We can confirm that there was an incident this week at Whitelee Windfarm. "Our thoughts go out to the family of the person involved." The wind farm is owned by Scottish Power but maintenance on its 215 turbines, which are between 360ft and 440ft tall, is carried out by GE. A Police Scotland spokesman said: "At around 10.10am, police and emergency services responded to reports of a 25-year-old man having fallen from a turbine at the Whitelee Windfarm. "He was pronounced dead at the scene. Investigations are at an early stage and the Health and Safety Executive has been informed. The death is not thought to be suspicious."